Weston County School District #1 is located in Newcastle, Wyoming, and includes Newcastle High School, Middle School and Elementary School. Its mission is to give its students the knowledge and skills to become ethical, responsible, productive citizens and lifelong learners. Several years ago Weston County School District #1 did an informal evaluation of its technology. Special attention was given to areas where it could offer staff and students more reliable service and the district bigger cost savings. One area identified was printing. At the time, the district used multiple vendors to supply it with a variety of printers, including desktop inkjet, standalone laser and fully integrated network laser printers. It also used multiple vendors to maintain its varying supply of toner. Many times these purchases were department specific, making a cost analysis very difficult. Beyond not having a clear idea of printing costs, the district staff also struggled to support the diverse number of printer models. “Our technology department was taxed when it came to maintenance. We’d clean the rollers and run some air through the machine—that was the extent of our expertise on maintenance. If the printer still wouldn’t work, our next step was replacement. So we would throw that machine out and buy a new one. If that was the only model we had left, we were stuck with two or three sets of toner as well,” said Ehlers. Having so many types of models and drivers also took a toll on the district’s print server, which would crash from time to time. “Every time it crashed it would take days to rebuild. We would be down for a quite a while,” he added. 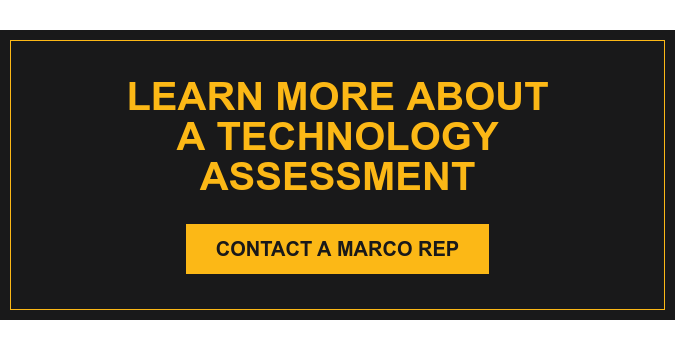 The district had a relationship with Marco for its copiers, so Ehlers consulted with his Marco Technology Advisor about the issues he was having. His advisor told him about Marco’s Managed Print Services. The first step in the implementation process was to create an environment with like models and drivers. Instead of maintaining 20+ models, the district scaled back to five or six. “Marco was fantastic at prepping us for the move. At the time, we had a lot of Dell network printers in our system. Marco made it extremely easy to upgrade to HP models and replace some of our legacy equipment. Since then, we haven’t had one issue with our print servers. Not one issue,” he said. Ehlers says having a more stable print server saves his staff valuable time and money. “Not having my staff rebuild print servers for four days frees them up to do other work that’s more important,” he added. The district realizes another big cost savings by eliminating the need to stock expensive toner that may or may not get used. With our tracking software, the replacement toner is sent to the district before the toner is out. “Having the toner automatically report in is a huge plus for us. The amount of money we save on toner alone has been wonderful,” said Ehlers. But, even with all the cost savings, Ehlers believes the biggest benefit of Marco’s Managed Print Services is the ability to make data-driven decisions. Now the district has a clear picture of not only how much it’s spending, but also which machines are printing what. This allows staff to put the right machines in the right place according to usage. “For us to be able to make data-driven decisions with the data that Marco provides has been the best long-term solution we’ve had,” said Ehlers. Ehlers has also been impressed with Marco’s customer service. Since the implementation, Marco provides annual maintenance support every summer and as needed. In an area as remote as Wyoming, Ehlers has been pleasantly surprised by the quick response times.